So I am a little excited that we are having a girl and figured I really only have three months before I need to start changing Caden's room into a girl room. Caden will slowly be moving into Connor's room and they will be sharing a room. Connor's room already is pretty much set up for two with a twin bed and a toddler bed in there so since Connor has began sleeping in his twin bed the toddler bed is waiting for Caden for when he is old enough. So my goal before April is to start moving all of Caden's things into Connor's room and start organizing their room and making it theirs instead of just Connor's and then hopefully by Spring Break or Easter weekend I can attack the nursery while Caden still sleeps in there and get the walls and room decorated by the end of May. The hardest thing for me right now is that Caden is only 8-1/2 mths old so he still needs his crib and we are praying real hard that he is walking by April (when he turns 1) so that we can put him in the toddler bed by this summer and him and the baby can share a room until he is ready with the baby in a bassinet and Caden in the crib. I really do not want to buy or borrow a crib for him. So we shall see. But anywho onto the fun stuff. 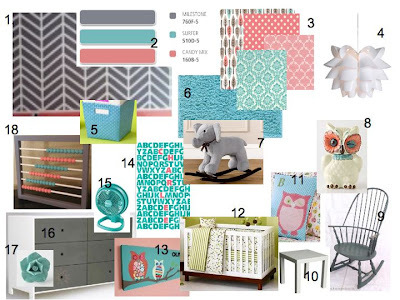 So I've been looking and planning what I want this nursery to look like for our little girl and I think this is what I have decided. I want to go with a Coral/Melon, Aqua, Gray, and White theme. 3.Bedding Fabrics - DIY - I'm making! So there you have it! Once we have a final named decided for this sweet girl I will start working on all my DIY projects and then the room won't get painted until March or April. I will keep you posted on my progress and my little projects.